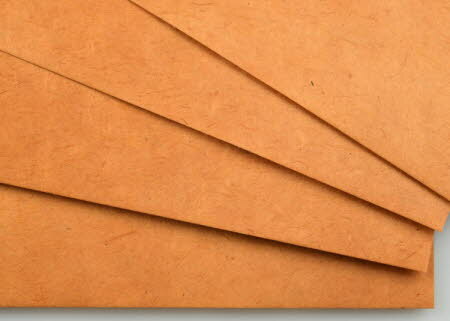 A rich reddish-brown Lokta A3 paper (pack of 25 sheets). This darker-coloured paper is ideal for scrap-booking and invitations etc, especially at larger font sizes, and is a fine, rich reddish brown, lightweight 55 gsm paper which is anything but plain. The lokta fibres are dyed with cutch, a natural dye used for centuries in India, making this paper look alive with movement. The paper has a smooth calendared top surface and a slightly less smooth reverse surface. We suggest that you use this paper one sided in laser printers but you can use it for two-sided printing in inkjet printers.